Team17, a veteran independent developer and publisher, has recently announced the release of their latest iOS puzzle game, Flockers. New from the creators of Worms, Flockers is a modern day take on the classic A to B puzzle genre. Already a huge success on the Xbox One, PlayStation 4, PC and Mac last year, the game’s 60 puzzling levels have now been redesigned for iOS devices. In the game, players must save the sheep by guiding them around deadly machines and helping them escape their masters. 60 deadly levels to guide the sheep safely across. 18 different sheep to choose from. Facebook connectivity allowing you to see your friends’ top scores and progress on the map screen. Welcome to the weekly round up post, this week we warn users to go and buy Neato before Apples pulls it for supposedly breaking their blurry guidelines for Notification Center Widgets. PocketFullOfApps has also announced an internship program which will last for two months. The well-known App Store developers, Crescent Moon, have also announced a Humble Mobile Bundle that features some of their most popular games. Apple has some pretty blury guidelines for what can be in the Notification Center and what can’t. This has already caused a bit of confusion regarding calculators in the NC and the late app-widget Launcher. This has got to be frustrating for developers and users alike. I personally heard about Launcher too late as I was stuck on iOS 7.1.6 due to a jailbreak not being released yet for iOS 8, by the time I got wind it was already gone in the blaze. Phoenix Online Publishing has recently announced that their #1 bestselling, retro-themed horror adventure The Last Door: Collector’s Edition is available to download for iOS devices. This award-winning tale compiles four episodes of occult and otherworldly terror into one completely set, adding new puzzles, scenes, and more, as well as enhanced graphics and sound. Players can download the first chapter free now, while chapters two to four of the game available for just $2.99 as an in-app purchase. Activision Releases ‘Duck Commander: Duck Defense’ for iOS! Best known for Call of Duty: Zombies, Activision Publishing has recently released their latest iOS title Duck Commander: Duck Defense — a new tower defense game led by television’s first family of duck hunting, the Robertson’s. In the game creatures of the wild have joined forces to push the Robertson’s, makers of the top-selling Duck Commander brand of duck calls, off their Louisiana Bayou homestead. It’s up to Willie, Si, Phil and Jase to use their tools and a healthy dose of redneck ingenuity to fend off these animal by any means. ‘Worms’ Franchise Celebrating its 19th Birthday with a Huge Sale! Originally launched on November 17th, 1995, Team17‘s infamous Worms franchise is celebrating its 19th birthday with a huge sale across many platforms including iOS, Mac, and Android. Despite the birthday being almost a week ago, the sale still appears to be continuing on in some places. As of right now we’re unsure how much longer these special discounts will last for, however, it doesn’t hurt to take a look just in case. Most games listed below are on sale for $0.99 with the exception of just a few, so if you have a couple bucks left in your iTunes account, now would be a good time to spend it. Everyone has differing preferences for their music needs on their iDevices; some people are heavy audiophiles and have nothing but FLACs in their iTunes, others do nothing but stream with Pandora or Spotify, and then there are people who are about in the middle like me. If you don’t need all of the functionality of the Music app then Transcynd is for you! It’s currently $0.99 on the App Store but the developer, Darran Hall told me that he plans on making it free for the next update after he polishes a few features and squashes a bug or two. He’s a great guy and deserves the money so I suggest you go buy it! ‘ANNO: Build an Empire’ Now Available on the App Store! Ubisoft, who recently released Valiant Hearts: Dogs of War, have also announced that ANNO: Build an Empire, the mobile spin-off from the iconic ANNO series, is now available to download on the App store for iPad and iPhone. Developed by Blue Byte in collaboration with Mi’pu’mi Games, the game offers the full ANNO experience, allowing players to create monumental cities on mobile devices. For a some time I’ve thrown around the idea of having an internship program for PocketFullOfApps, but never decided on anything until now. After some careful consideration and talking to the fellow team members, I’m proud to announce the PocketFullOfApps Internship Program where we will bring two interns onto the team for two months. Those interns who we choose will have the opportunity to join a well established tech and gaming blog and reach a monthly audience of over 600,000 page views. This is a perfect opportunity for those who want to get a start in the tech blogging and writing world, but don’t know where to begin. Sticky notes are a part of a lot of people’s lives; used for everything from jotting down tiny notes to managing large scale projects (if you do it right.) They are integrated into Mac OS X and there are several free programs for PC’s that offer the same functionality. Omitted from stock iOS for some reason, I can see why Apple might not want to include them on the iPhone but they surely have a home on the iPad. Sticky in Cydia on the ModMyi repo by William Vabrinskas, will bring you this awesome functionality to your iPhone or iPad for just $0.99. I can’t recommend this tweak enough; it’s lightweight, feature filled and “just works”. Accidents happen and Zak the janitor has made quite a big one in Flyhunter Origins. While “The Frog”, the legendary Flyhunter crew’s ship, is near Earth’s orbit, Zak accidentally jettisons some precious and expensive cargo. The Flyhunter crew was deep in cry sleep and were also jettisoned from the ship. Zak desperately needs your help to correct his mistake and time is of the essence since investors are patiently waiting for the Flyhunters to deliver the rare bug collection the Flyhunter crew has promised. Evolution: Battle for Utopia, My.com’s hit sci-fi action RPG, is getting a major content update early next year with “Legacy of Dominion” which will bring new story scenarios, mysterious planets and powerful items to the game. With more than 4 million players duking it out in sci-fi mobile battles, Evolution: Battle for Utopia is continuing to expand the content for one of the largest in-game mobile worlds that was also featured as one of Apple’s “Best New Games” at launch. Originally launched on November 17th, 1995, Team17‘s infamous Worms franchse is celebrating its 19th birthday with a huge sale across many platforms including iOS, Mac, and Android. Despite the birthday being almost a week ago, the sale still appears to be continuing on in some places. As of right now we’re unsure how much longer these special discounts will last for, however, it doesn’t hurt to take a look just in case. Most games listed below are on sale for $0.99 with the exception of just a few, so if you have a couple bucks left in your iTunes account, now would be a good time to spend it. Great British Game Jam 2014 Winner ‘(R)evolve’ Out Now on the App Store! 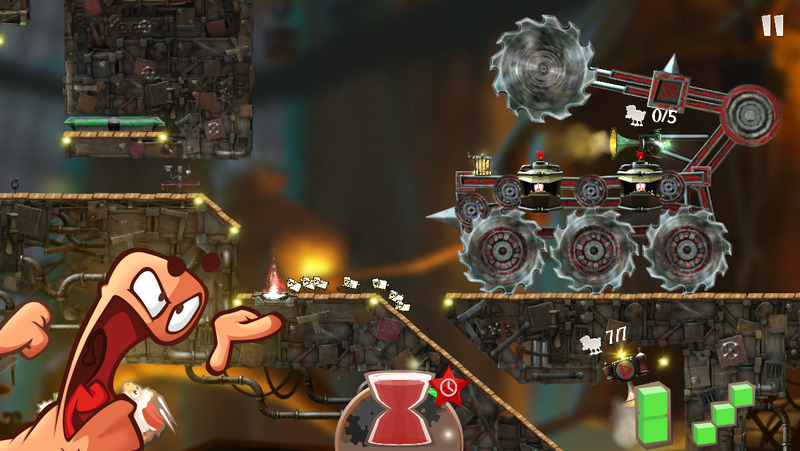 Team17, developers of the famous Worms franchise, have announced that their Great British Game Jam 2014 award-winning iOS title (R)evolve is now available on the App Store to download for the iPhone and iPad. Originally prototyped in just 48 hours, (R)evolve was Team17′s entry into the Great British Game Jam 2014 which took place on February 6th and 7th. In the game, life is evolving on an alien planet and you must protect it. Players must withstand a constant bombardment of meteorites from outer space, spin the planet to save its inhabitants and evolve and spread life. The more life you can evolve and the longer you can keep it alive, the higher your score will be. Moving forward, (R)evolve features crisp Retina-display graphics, a simple control system, as well as fast paced gameplay. Going off of Team17‘s track record of their Worms franchise, it’s safe to say that this game probably won’t disappoint and will be a lot of fun. That being said, it’s also nice to seem the branch away from Worms and try something else out. Simply tap the left and right sides of the screen to rotate the planet. Beautiful HD graphics that take full advantage of retina displays. Log in with Game Center and post your high scores to the online leaderboards. ‘Worms 3’ Gets New Update with New Content! All new Fire Fighter card pack including 5 explosive new playing cards. 6 new Campaign levels set in the Junkyard theme. 1 new Body count level set in the Junkyard theme. Christmas themed content for your worms. Including festive customization items and weapons. Introduced the double jump as a separate button on the HUD in game. Entries (RSS) | Comments (RSS) | 85 queries in 0.855 seconds.